Description: This is the first that I've seen this under the cover, and without the tarp over it. Description: According to Wiki-pedia, "The Kansas City Public Service Company was the most well known name for a series of public transit operators in Kansas City, Missouri, until being sold to the Kansas City Area Transportation Authority in 1969. One of the most famous routes, "The Country Club Line", still had rail until the 1990s when it became a hike/bike recreation trail." 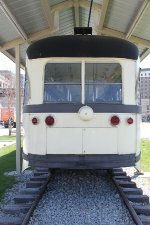 Description: This is one of the 184 PCC streetcars Kansas City acquired after 1941, but streetcar operations ceased by 1957. 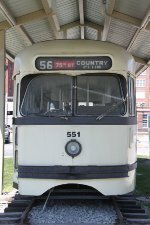 Description: Rear view of PCC #551. Description: Interesting logo for the streetcar system! Description: Kansas City Public Service PCC is parked outside Kansas City Union Station.